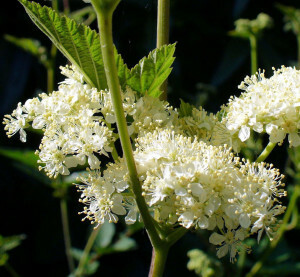 Filipendula ulmaria is a perennial herb that can be found throughout the country. It grows in sunshine, on damp ground & in wet meadows & ditches. Its strong reddish-brown stems can reach over two metres in height. Leaves are pleated, dark green with a heavy almond-like aroma. From June through August a froth of tiny CREAM flowers with the fragrance of vanilla appears at the stem tips. 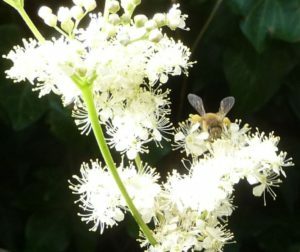 The sweet scent of these flowers animates the many bees drawn to Meadowsweet for its pollen, as can be seen on our videos. Moths, dragonflies, hoverflies, ladybirds & other pollinators are also keen on this wildflower. Meadowsweet is on the list of plants rated by the RHS Perfect for Pollinators. These insects transfer pollen and increase seed set and fruit development. 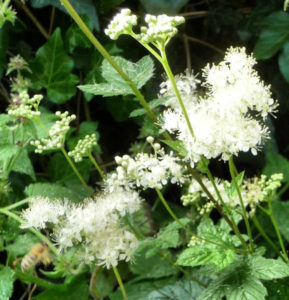 The Celts used the roots of Meadowsweet to produce a black dye; a blue pigment was obtained from the leaves, & yellow from the top of the plant. 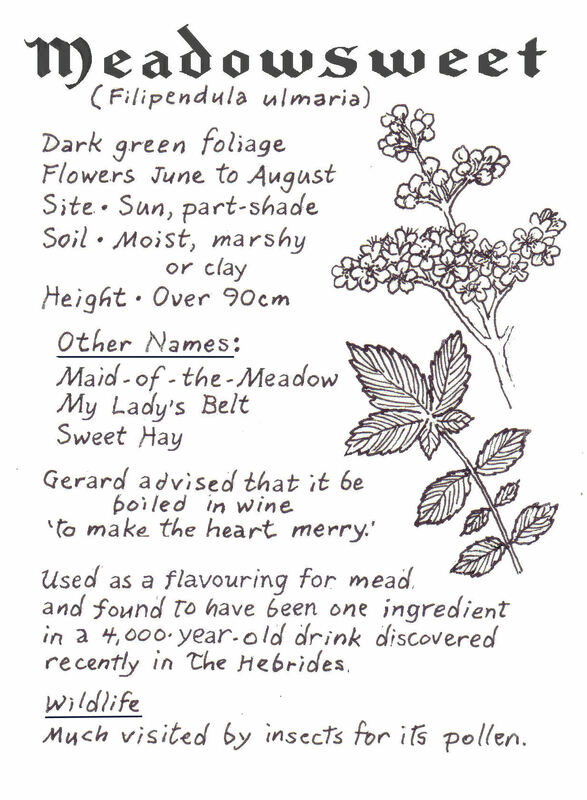 In Ireland Meadowsweet is used to scour milk vessels. 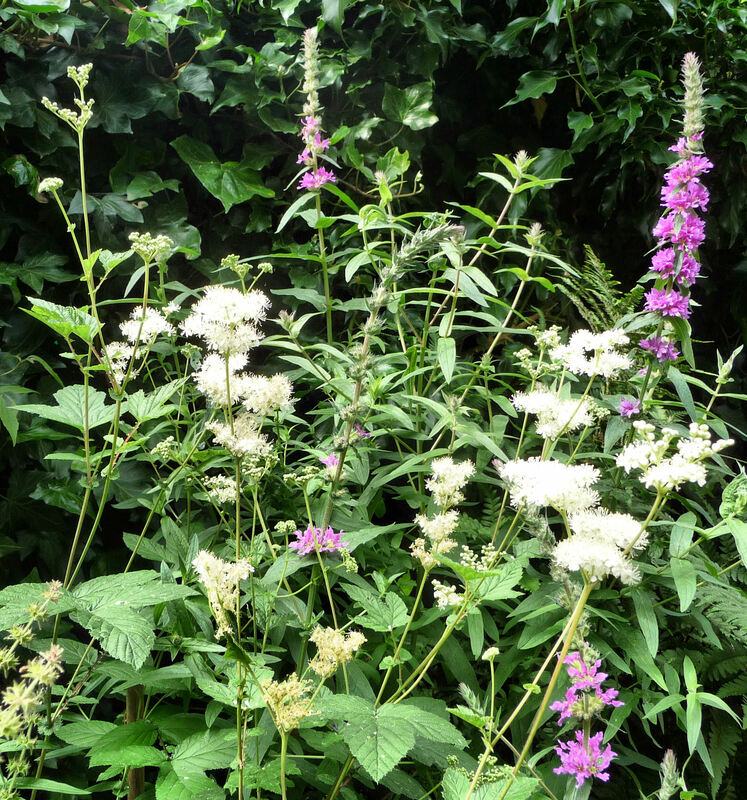 …flowery tops contain Salicylic acid – nature’s aspirin’. In 1897, chemists at Bayer produced synthetically altered salicin, which helps alleviate fever, headache and pain. 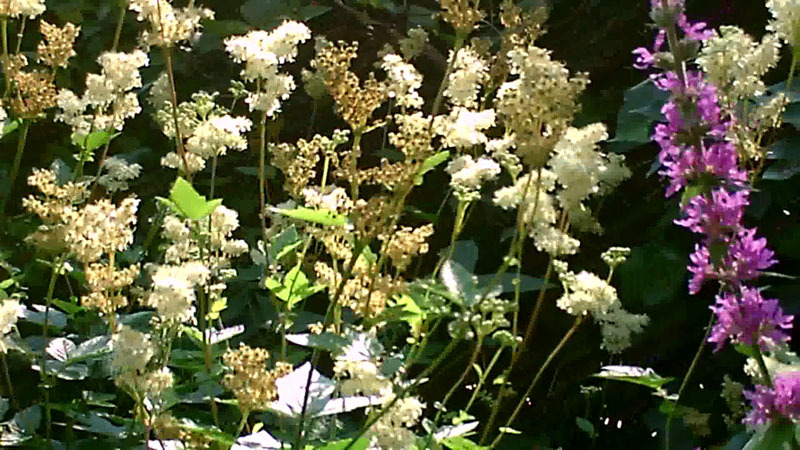 They named it Aspirin (acetyl + spiraea ulmaria) after the plant’s earlier botanical name, Spiraea ulmaria. ‘The name meadowsweet is said to come, not from the fact that it grows in meadows as one would expect, but from its early use to flavour mead, evolving from Middle English Medewurte, as it appears in Chaucer’s The Knight’s Tale. Find more herbal & historical details of Meadowsweet on the extensive Whispering Earth website. 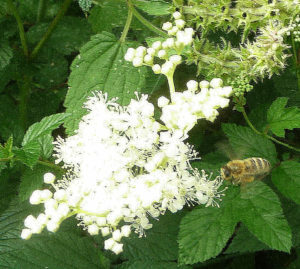 Sacred to the Druids, Meadowsweet was laid on floors in the Middle Ages as a fragrant strewing herb to be walked on, or on wooden church pews to be sat on. 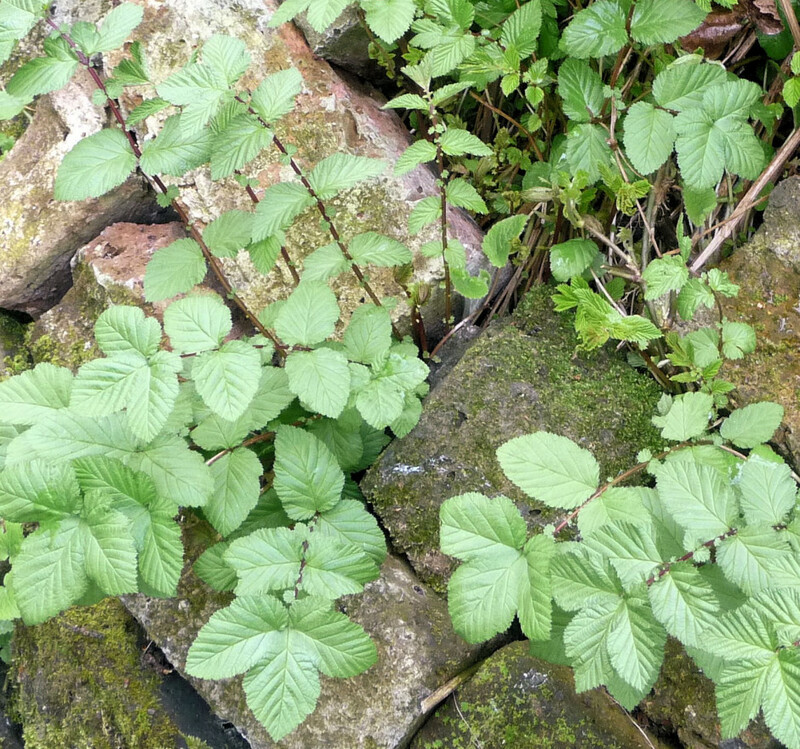 For medieval wedding festivals it was strewn with Salad Burnet, which smells of cucumber. Other names: Altarreina, Barbe de Bouc, Barbe de Chevre, Brideswort, Courtship and Marriage, Crios Chu-chulainn, Dolloff, Dropwort, Ergecsakali, Fausse Spiree, Filipendule, Floron, Goat’s Beard, Hayriff, Hierba de las abejas, Honey-flower, Kiss Me Quick, Lady of the Meadow, Meadow-Wort, Meadswort, Meadsweet, Moerasspirea, Mountain Spirea, Petite Reine, Pride of the Meadow, Quaker Lady, Queen of the Ditch, Queen of the Meadow, Queen of the Prairie, Racine de Gravier, Reina de los Prados, Reine de la Prairie, Reine-des-Pres, Spiraeae Flos, Spireae Herba, Ulmaria. 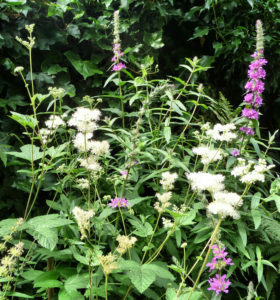 Our Meadowsweet patch began life as a rooted stem, given away by the conservation team at Gillespie Park’s Ecology Centre. Dug up one Volunteer Day as we replanted the entrance on Gillespie Road, it made way for other plants. Brought back to our garden & planted in sun at the damp edge of the fern bed, it blooms every summer with nearby Purple Loosestrife, bringing in the bees. No pests or diseases trouble it.